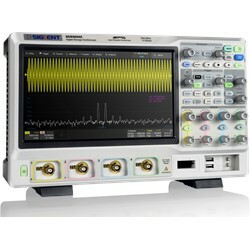 SDS5000X Siglent Oscilloscopes ! !Special Offers!! For the SDS5000X range, serial decoding (RS232, I²C, SPI, LIN and CAN), a built-in 1 channel waveform generator at 25 MHz (125 MSa/s) and an additional built-in 16 channel logic analyzer can also be added with a software code. 2 channel DSO with 350 MHz bandwidth, 5 GSa/s and 250 Mpts memory depth and a 25.7 cm LCD touch-display (1024x600 pixel). Upgradable to a MSO with a 16 channel logic analyzer, 1 channel waveform generator and pattern generator. 4 probes SP2035A (350MHz bandwith), USB cable, power adapter and quick start manual. 4 channel DSO with 350 MHz bandwidth, 5 GSa/s and 250 Mpts memory depth and a 25.7 cm LCD touch-display (1024x600 pixel). Upgradable to a MSO with a 16 channel logic analyzer, 1 channel waveform generator and pattern generator. 4 probes SP2035A (350 MHz bandwith), USB cable, power adapter and manual. 2 channel DSO with 500 MHz bandwidth, 5 GSa/s and 250 Mpts memory depth and a 25.7 cm LCD touch-display (1024x600 pixel). Upgradable to a MSO with a 16 channel logic analyzer, 1 channel waveform generator and pattern generator. 4 probes (500 MHz bandwith), USB cable, power adapter and manual. 4 channel DSO with 500 MHz bandwidth, 5 GSa/s and 250 Mpts memory depth and a 25.7 cm LCD touch-display (1024x600 pixel). Upgradable to a MSO with a 16 channel logic analyzer, 1 channel waveform generator and pattern generator. 4 probes SP3050A (500 MHz bandwith), USB cable, power adapter and manual. 2 channel DSO with 1 GHz bandwidth, 5 GSa/s and 250 Mpts memory depth and a 25.7 cm LCD touch-display (1024x600 pixel). Upgradable to a MSO with a 16 channel logic analyzer, 1 channel waveform generator and pattern generator. 4 channel DSO with 1 GHz bandwidth, 5 GSa/s and 250 Mpts memory depth and a 25.7 cm LCD touch-display (1024x600 pixel). Upgradable to a MSO with a 16 channel logic analyzer, 1 channel waveform generator and pattern generator.